The presidential election in Iran, scheduled for May 19th, witnessed a major development last Thursday when Ebrahim Raisi, of the “principalists” faction and considered a close confidant of Iranian Supreme Leader Ali Khamenei, announced his candidacy. A few weeks ago, 50 members of the all-clerics Assembly of Experts, the body in charge of appointing the next supreme leader, issued a letter to Khamenei calling for Raisi to become the regime’s next president. Raisi himself had informed the regime’s various factions he will participate only if he enjoys Khamenei’s blessing. The incumbent President Hassan Rouhani, the so-called “reformist” seeking a second term, had coincidently made it clear to his inner circle of gaining Khamenei’s approval to take part in the election. Up to now, we can reach an initial conclusion that the charade Tehran is dubbing an election is more a selection, as both the main candidates are first seeking the approval of one individual before they ever begin campaigning among the general public. Other candidates currently in the race include Hamid Baqai, a former vice president during the administration of former president Mahmoud Ahmadinejad and former nuclear negotiator Saeed Jalili. Tehran Mayor Mohammad Baqer Qalibaf has recently opted out. For the Iranian people, however, they are generally faced with one highly deceptive figure, that being Rouhani, who is known as the “Purple Fox”, and Raisi, an utterly brutal individual, known for his decades of service to the regime’s judiciary in sending thousands of people to the gallows. Rouhani’s report card as a security official, who, in his own words, has been involved in all of the Iranian regime’s important decisions, shows an active role in repressive measures against women in the early days after the 1979 revolution, sending children and juveniles onto minefields during the Iran-Iraq War, quelling the 1999 student uprising, advancing Iran’s clandestine nuclear weapons program and deceiving the international community, and over 3,000 executions during his four years as president. We have also witnessed general poverty skyrocketing, a large swathe of Iran’s economy coming to a halt, and much of the country’s assets being allocated to foreign meddling in Syria, Iraq, Yemen, and beyond. Raisi has been climbing the regime ladder through the judiciary, proving his loyalty to the establishment as Tehran’s deputy public prosecutor, issuing death sentences easily at a strike of a pen, and known for his support of atrocious mass executions. Most horrifying of all is Raisi’s membership in the notorious “Death Commission” behind the 1988 massacre of over 30,000 political prisoners, mostly members and supporters of the Iranian opposition People’s Mojahedin Organization of Iran (PMOI/MEK), to the gallows. Khamenei rewarded Raisi by appointing him Tehran’s prosecutor, head of the country’s Inspector Organization, judiciary deputy, the public prosecutor of the Special Clerics Court, and the regime’s leading public prosecutor. Most recently Khamenei trusted Raisi by placing him in charge of the Astan Quds Razavi, a so-called foundation considered to be one of Iran’s most powerful political and economic entities. A large percentage of this regime’s budget used to export terrorism and fundamentalism through the Revolutionary Guards abroad is provided by this very institution. Reports from inside Iran indicate a sense of escalating public hatred amongst the Iranian people regarding the regime’s sham presidential election. People do not trust any of the regime’s factions or their candidates. Iranians inside the country and abroad have taken to social media to say “My vote is regime change”. 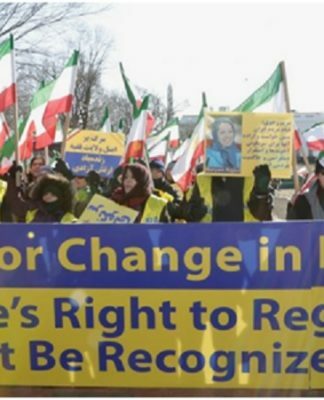 The MEK has recently posted a statement on its website, widely viewed inside Iran, calling on people from all walks of life under this regime’s repression to boycott the elections. “Freedom and free elections based on the people’s right to sovereignty,” the statement reads in part, inviting the entire nation to “nationwide campaign” aimed at shunning the elections through a variety of protests. The power struggle between the Iranian regime’s factions and their representatives, such as Rouhani and Raisi, is merely a dispute over usurping a larger share of plundering the Iranian people’s resources. A further inner struggle in Tehran is a clear indication of this regime’s failure in facing escalating domestic and international crises. This includes the recent U.S. airstrikes against an Assad military airfield in Syria, sending a strong message of shifting tides to Iran. The regime in Tehran is terrified of all this turmoil spilling into a powder keg society with the potential of repeating the 2009 uprisings. Only this time around at a much larger scale. Next articleWhy Boeing and Airbus deals with Iran shouldn’t fly?